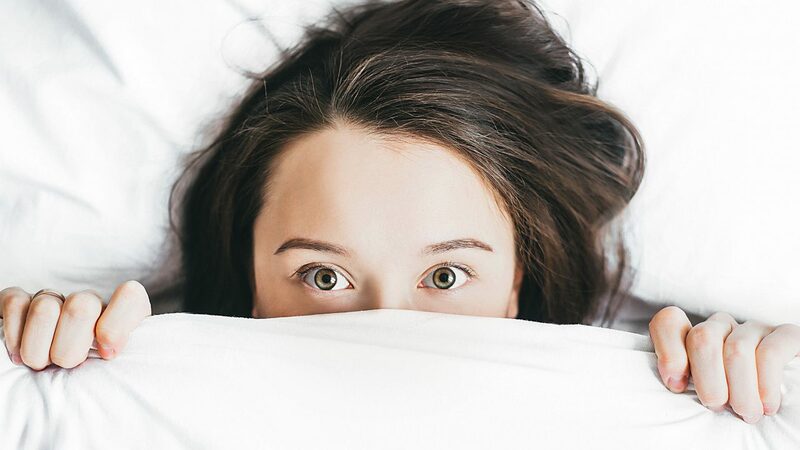 No matter how healthy you are, sleep deprivation (insomnia) will eventually take away good health and, it will do so in a variety of undesirable ways. With that said, good sleep is one of the primary cornerstones of good health, mentally, biologically and emotionally. Six to eight hours per night seems to be the optimal amount of sleep for most adults, and too much and, in particular, too little can have adverse effects on your health. Sleep deprivation is such a chronic condition these days that you might not even realize you are a victim. Lack of sufficient Phase IV sleep will, in time, have serious, far reaching effects on your health. When your circadian rhythms are disrupted, your body produces less melatonin (a hormone & an antioxidant) and has less ability to fight cancer, since melatonin helps suppress free radicals that can lead to cancer. This is why tumors grow faster when you sleep poorly. Sleep deprivation prematurely ages you by interfering with your growth hormone production, normally released by your pituitary gland during deep sleep (and during certain types of exercise, such as Peak Fitness Technique). Growth hormone repairs normal cell damage and helps you look & feel younger. One study has even shown that people with chronic insomnia have a three times greater risk of dying from any cause. Lost sleep is lost forever, and persistent lack of sleep has a cumulative negative effect on your health. Poor sleep can make your life miserable. The good news is, there are many natural methods that will help you restore quality, Phase IV sleep. 1. Sleep in complete darkness, or as close to it as possible. The predictable patterns of light and darkness control your circadian rhythms. Electricity has significantly betrayed our internal clocks by generating artificial light, thus, disrupting your natural circadian rhythms. When sleeping, even small amounts of light passes through your eyelids and then to your hypothalamus, via optic nerve, which controls your biological clock. When the sun comes up, natural daylight signals your brain that it’s time to wake up and starts preparing your body for the activities of the day. Even the tiniest bit of light in the room can disrupt your internal clock and your pineal gland’s production of melatonin and serotonin. This includes the glow from your clock radio. Close your bedroom door, and get rid of night-lights. Refrain from turning on any light at all during the night, even when getting up to go to the bathroom. Cover up your clock radio. Cover your windows—using blackout shades or drapes. If all else falls short, wear a soft scarf over your eyes or use a sleep mask. 2. Keep the temperature in your bedroom no higher than 70 degrees F. Many people keep their homes and particularly their upstairs bedrooms too warm. Studies show that the optimal room temperature for sleep is quite cool, between 60 to 68 degrees. Keeping your room cooler or hotter can deprive you of deep Phase IV sleep. 3. Check your bedroom for electro-magnetic fields (EMFs). These disrupt pineal gland function, thereby inhibiting the production of melatonin and serotonin and may have other negative effects as well. How do we measure EMF’s? A gauss meter. An online search will give you the range of about $50 to $200. Some have wired their homes so they are able to shut off all electricity in the bedroom and some even shut off the circuit breaker before bed to kill all power in your house. 4. Move alarm clocks and other electrical devices away from your bed. If these devices must be used, keep them as far away from your bed as possible, preferably at least 3 feet. Remove the clock from view. It will only add to your worry when you stare at it all night. 5. Avoid using loud alarm clocks. It is very stressful on your body to be suddenly jolted awake. If you are regularly getting enough sleep, an alarm may not be necessary. Many have given up their traditional alarm clocks and now use a sun alarm clock, an alarm that combines the features of a traditional alarm clock (digital display, AM/FM radio, beeper, snooze button, etc.) with a special built-in light that gradually increases in intensity, simulating sunrise. 6. Reserve your bed for sleeping & intimacies. If you are used to watching TV or doing work in bed, you may find it harder to relax and achieve restful, Phase IV sleep, so get these devices out of your bedroom when you finish reading this article. 7. Consider separate bedrooms. Recent studies suggest, for many people, sharing a bed with a partner (or pets) can significantly impair sleep, especially if the partner is a restless sleeper or snores. If your husband or wife is consistently interfering with your sleep, you may want to consider a separate bedroom. 8. Get to bed as soon after sundown as possible. Your body (particularly your adrenal system) does a majority of its recharging between the hours of 11 p.m. and 1 a.m. In addition, your gallbladder dumps toxins during this same period. If you are awake, the toxins back up into your liver, which can further disrupt your health. Prior to the widespread use of electricity, people would go to bed shortly after sundown, as most animals do, and which as an integral part of your circadian rhythms as well. 9. Don’t change your bedtime. You should go to bed and wake up at the same times each day, even on the weekends. This will help your body to get into a sleep rhythm and make it easier to fall asleep, stay asleep and get up in the morning. 10. Establish a bedtime routine. This could include meditation, deep breathing, using aromatherapy with organic essential oils, or a relaxing massage from your partner. The key is to find something that makes you feel relaxed, then repeat it each night to help you release the tensions of the day. 11. Don’t drink any fluids within 2 hours of going to bed. This will reduce the likelihood of needing to get up and go to the bathroom, or at least minimize the frequency. 12. Go to the bathroom right before bed. This will reduce the chances that you’ll wake up to go in the middle of the night. 13. Eat a high-protein snack several hours before bed. This can provide the L-tryptophan needed for your melatonin and serotonin production. 14. Also eat a small piece of fruit. This can help the tryptophan cross your blood-brain barrier. 15. Avoid before-bed snacks, particularly grains and sugars. These will raise your blood sugar and delay sleep. Later, when blood sugar drops too low (hypoglycemia), you may wake up and be unable to fall back asleep. 16. Take a hot bath, shower or sauna before bed. When your body temperature is raised in the late evening, it will fall at bedtime, facilitating slumber. The temperature drop from getting out of the bath signals your body it’s time for bed. 17. Wear socks to bed. Feet often feel cold before the rest of the body because they have the poorest circulation. A study has shown that wearing socks to bed reduces night waking. As an alternative, you could place a hot water bottle near your feet at night. 18. Wear an eye mask to block out light. As discussed earlier, it is very important to sleep in as close to complete darkness as possible. That said, it’s not always easy to block out every stream of light using curtains, blinds or drapes, particularly if you live in an urban area (or if your spouse has a different schedule than you do). In these cases, an eye mask can be helpful. 19. Spend the hour before you go to bed in “Wind-Down” mode (preferably two hours). This will give your mind a chance to unwind so you can go to sleep feeling calm, not hyped up or anxious about tomorrow’s deadlines. It is especially important to stop work during this time. All conversations need to be calming and relaxing. Save all stress infused talk for tomorrow morning. 20. No TV right before bed. Even better, get the TV out of the bedroom or even completely out of the house. It’s too stimulating to the brain, preventing you from falling asleep quickly. TV also disrupts your pineal gland function. 21. Listen to relaxation CDs. Some people find the sound of white noise or nature sounds, such as the ocean or forest, to be soothing for sleep. An excellent relaxation/meditation option to listen to before bed is the Insight audio CD. 22. Read something spiritual or uplifting. This may help you relax. Don’t read anything stimulating, such as a mystery or suspense novel, which has the opposite effect. In addition, if you are really enjoying a suspenseful book, you might be tempted to go on reading for hours, instead of going to sleep! 24. Reduce or avoid as many drugs as possible. Sleeping pills may help you fall asleep, but they inhibit restful, Phase IV sleep. While you may be unconscious for 12 or more hours, you will not feel refreshed the day after you take sleeping pills. Most other drugs, both prescription and over-the-counter, may adversely affect deep sleep. In most cases, the condition for which one elects drugs to treat a disorder, can be addressed by following safe, natural choices. See e-sa.com. 25. Avoid caffeine. At least one study has shown that, in some people, caffeine is not metabolized efficiently, leaving you feeling its effects long after consumption. So, an afternoon cup of coffee or tea will keep some people from falling asleep at night. Be aware that some medications contain caffeine (for example, diet pills). And, for others, caffeine consumption in the morning can block quality sleep. 27. Make certain you are exercising regularly. Exercising for at least 30 minutes per day can improve your sleep. However, don’t exercise too close to bedtime or it may keep you awake. Studies show exercising in the morning is the best if you can manage it. 29. Avoid foods you may be sensitive to. This is particularly true for sugar, grains, and pasteurized dairy. Sensitivity reactions can cause excess congestion, gastrointestinal upset, bloating and gas, and other problems. 30. Have your adrenals checked by a good natural medicine clinician. Scientists have found that insomnia may be caused by adrenal stress. 31. If you are menopausal or perimenopausal, get checked out by a good natural medicine physician. The hormonal changes at this time may cause sleep problems if not properly addressed. 32. This Technique Will Help You Sleep & Address a Myriad of Emotional Issues: Emotional Freedom Technique (EFT). Most people can learn the basics of this gentle tapping technique in a few minutes. EFT can help balance your body’s bioenergy system and resolve emotional stresses deep within your subconscious that are contributing to your insomnia. The results are typically long lasting and improvement is remarkably rapid. 33. Increase your melatonin. Sunlight in the daytime (along with full spectrum fluorescent bulbs in the winter) is the best way to increase levels naturally and absolute complete darkness at night. If needed, consider a safe, natural sleep supplement containing melatonin. In scientific studies, melatonin has been shown to increase sleepiness, help you fall asleep more quickly, stay asleep, decrease restlessness, and reverse daytime fatigue & foggy thinking. Melatonin is a completely natural substance and has many other health benefits. Thank you for the reasonable & practical suggestions. I am sure that by reviewing my habits I will be able to improve my sleep. Thank you for information. Useful content.